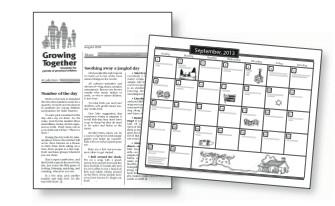 A four-page e-newsletter with an activity calendar. Add your organization’s name, reproduce and make available monthly to your client parents. Growing Together is a monthly e-newsletter delivered to you each month in PDF. Add your name, reproduce it as your own and send it home with the children ... or clip specific articles for your newsletter. Authoritative, interesting articles help build a bond with parents. The Growing Together staff searches out new research articles and information about young children, digests it and presents it in simple, easy-to-read articles that help parents feel better about their situations – and feel better about what you are doing on their behalf.